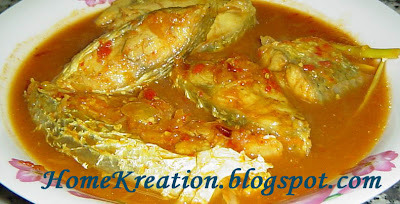 Kampung Sour Fish Stew is a tranlation of "Ikan Masak Asam ala Kampung". This is a healthy dish as no fat added. The Kampung dish is perfect when accompanied with Kampung salad : Kampung Boiled Banana Flower dipped in "Sambal Belacan". Place all ingredients in a pot & boil until fish is cooked. Laksa Johor is a famous Southern Peninsular Malaysian spaghetti served with creamy fish paste gravy flavoured with local herbs like Polygonum, Ginger Buds and Mint Leaves. 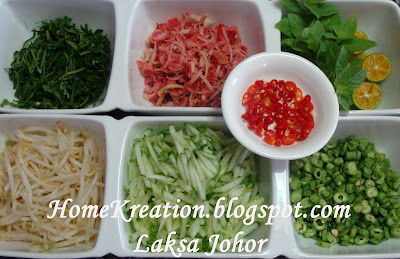 Let's cook the scrumptious Laksa Johor with me and make sure you have all the ingredients ready. 1. Clean fish & grill until dry. Flake off the bones and pound. Grind the bones with some water & filter the bone stock. 2. Heat oil in a big pot. Fry blended ingredients until fragrant. Add Salt, palm sugar, tamarind, pounded fishflakes & roasted coconut paste. 3. Serve spaghetti with gravy & with garnish ingredients shown in the photo above. This is a typical Malay Kampung kueh served at tea time. Very simple ingredients and method that anyone can make this with success. No accurate measurement is necessary. I have indicated rough measurements below only as a guide. 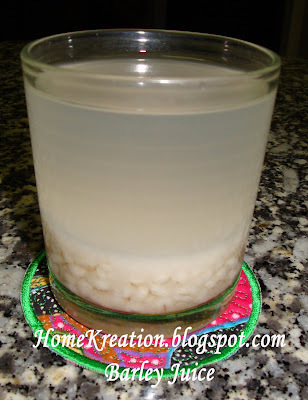 I have plenty of tapioca that my mother-in-law brought from kampung so made this today in the evening for tea time. 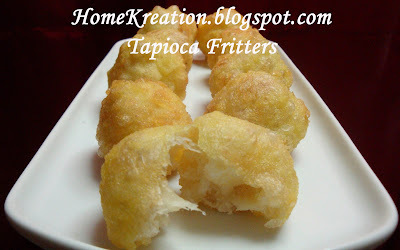 - The consistency is runny like those used for banana fritters. 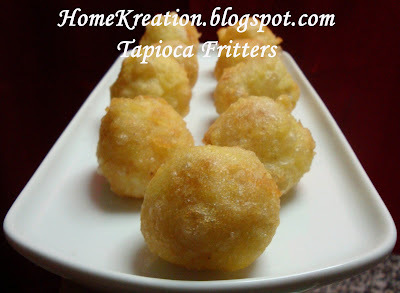 Dip in batter and deep fry until golden. TEPUNG CELUP: 3 sudu Tpg Gandum + 2 sudu Tpg Beras + secubit Garam + sedikit serbuk Kunyit + Air secukupnya. Kecairan macam tepung goreng pisang. Gaul kesemua bhn2 sehingga sebati. Bulat2 kan. Celup ke dlm bancuhan tepung. Goreng sehingga keperangan. 1. Heat cooking oil. Fry salted fish until golden and lift into a plate. 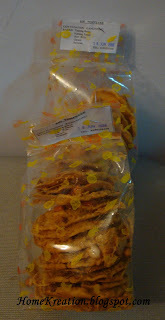 Fry dried shrimp and lift out. 2. Fry blended ingredients until fragrant & dry. Add in while stirring, chicken, all type of sauce and Ikan Bilis cubes and vegetable. Add in rice and stir until well blended and rice are heated up. Add in the rest of oher ingredients and dish up. 3. Served with fish/prawn crackers, chicken nugget, etc of your choice. 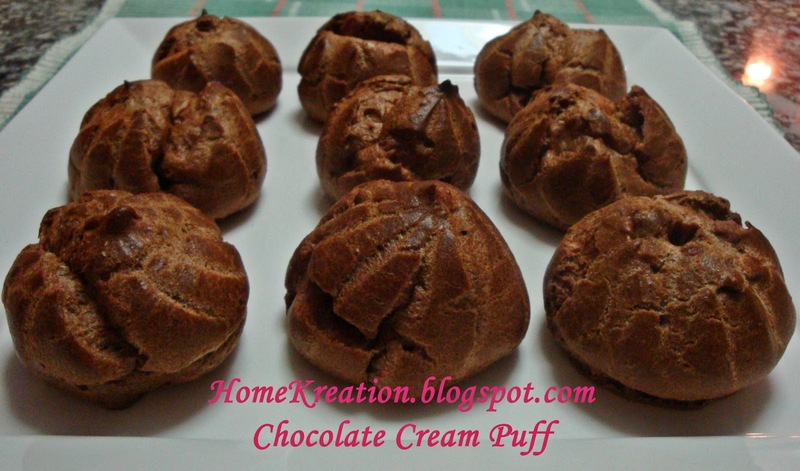 This delicious Chocolate Cream Puff will surely allure you for more & more....! 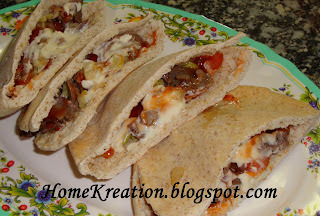 Easy and quick to make will be a good idea for last minute unplanned entertaining. 1. Sift flour & cocoa together & put aside. 2. Boil the rest of ingredients, except eggs, until the butter is melted and remove from heat. Pour in flour mixture, all at once. Mix well. Beat in egg one at a time untill well blended. 3. Pipe or spoon onto greased baking tray. Bake for 25 minutes at 210C. Cool. 4. To make the chocolate custard, place 4 egg yolks, 100g sugar, 60 g flour, 600ml milk & 80-100g chocolate in a saucepan. Stir until thicken & boiled. 5. 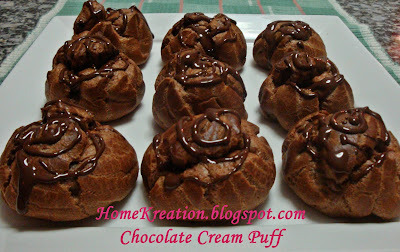 Cut a slit & spoon chocolate custard into the puffs or inject the custard using injection nozzle. 6. Drizzle melted chocolate on top. I used Swiss chocolate fondue bought at KLIA. As I mentioned in my previous post, I made Roti Canai with no specific measurement but through 'feel & skill'. However, I have attempted to measure the ingredients when I made it this morning, so that I could share the recipe herewith. 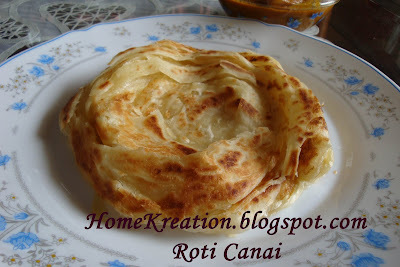 In order to produce soft lasting Roti Canai, it is important to acquire the skill in handling & kneading the dough. The tip is kneading until the dough is soft & elastic but do not over kneading. You will also find that my recipe below produces less oily Roti Canai compared to those sold in stalls & restaurants and yet very soft layers. 1. Mix all ingredients except margarine & oil until a soft dough is formed. Add in margarine & knead. 2. Divide into 18-20 pieces. Rest for minimum 10 minutes. 3. Flatten each ball & pull until tissue thin. Use sufficient amount of oil while shaping the dough. 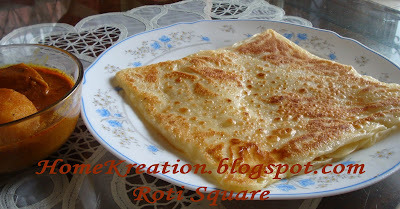 Shape to desired type (Roti Canai/ Boom/ square). [Alamak forgot to snap the dough coil]. 4. Fry on hot griddle without oil initially. Add 1 tsp margarine a bit later and cook until golden. 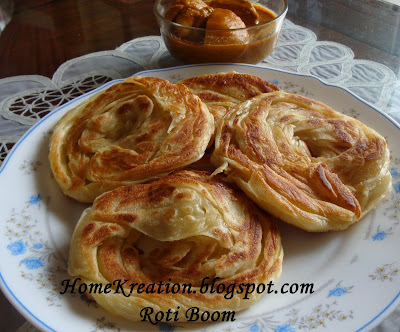 Don't forget to flip the roti all the time to ensure it cooked evenly. When cooked, mash roti lightly with both hand. 5. Serve with your favourite curry or rendang. I love this dish but cockles are expensive in Sarawak. They cost 10x the price in my hometown in the Peninsular. I used the same Rendang recipe to cook chicken, beef, prawn and any other meat/seafood. 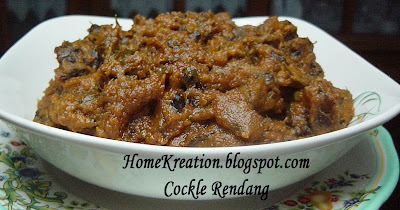 My Rendang recipe used least variety of ingredients, the way my mum cooks hers, but rest assured of delicious result...! Yummy! 1. Place coconut milk, chilli paste & blended ingredients in a wok. Boil until thick & oil emerges from the surface. 2. Add in cockles, sliced turmeric leaf, tamarind piece, salt & MSG. Stir all the time until the gravy is dry and cockles are cooked (it is important not to overcook the cockles otherwise they will turn out hard). 3. 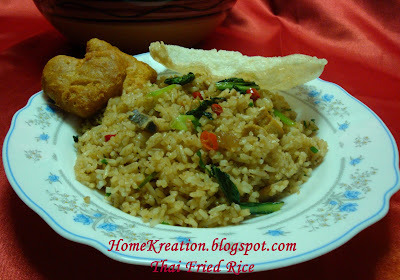 Serve with white rice, Nasi Lemak or roti. a. 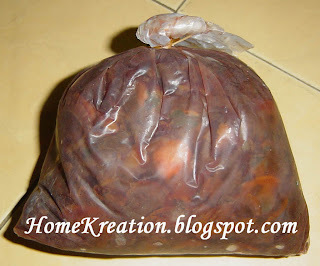 If making chicken or meat rendang, place them with all other ingredients in step 1 and stir with slow heat until done. b. Cook the Rendang to your preferred dryness. My children prefer it a bit wet whilst my mum will always cook hers until very dry because she normally cooks in large volume which can be kept until the next day. This morning we had Fried Mee Hailam. 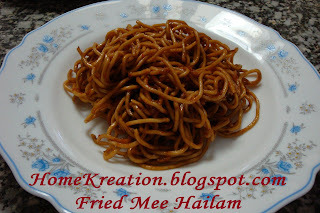 The noodles/mee is first fried just like cooking Fried Mee and Hailam gravy is cooked separately. See photo below before gravy is added. 1. Mix rice with salt & pepper. 2. Heat up cooking oil & fry sliced shallots & garlics until golden. Dish out. Place pounded ingredients in the oil & fry until fragrant. Add in beef & stir until beef is cooked. Pour in oyster sauce - stir for a while & add in mixed vegetable. Add in rice, soya sauce and stir until all ingredients are well mixed. 3. Serve with fried onion/garlic chopped celery+spring onion, fish cracker and your choice of fresh salad/vegetable. ENJOY!! Barley has cooling effect to body and its internal being besides rich of nutrients. 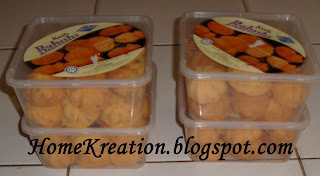 For me, I just love the taste and the homemade is the best which is additives free. 1. Wash barley & place in a pot with sufficient amount of water to cook the barley. As a guide, the water should be double the depth of the barley in the pot. It is not necessary to put a lot of water at this stage. Boil until barley is tender which may take about 30 minutes or more, depending on method of cooking (I always cooked in a 5-ply stainless pot which ususally take only 30 minutes). 2. Once barley is tender, add more water to the volume required, screwpine leaf and sugar. Boil until sugar get dissolved. 3. Serve warm or cold. 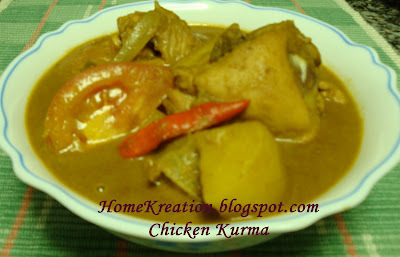 I always cook my Chicken Kurma with thick gravy but actually using thin coconut milk. The secret is using less coconut milk but generous amount of Kurma spice. This way, I'm hoping that my cholestrol will not be getting worst. 1. 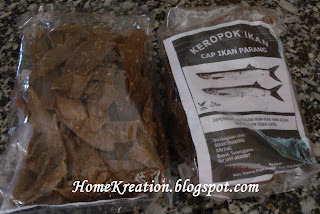 Mix pounded ingredients* with kurma & curry powder and add enough water to form into paste. 2. Heat up oil in cooking pot & add in ingredients marked ** & kurma paste. Stir until the paste is fragrant and some oil appear from it. Add few tbs of water if it too dry, at anytime before the paste is properly 'cooked' (indicated when oil appear from the paste). This is an important step to ensure tasty Kurma. 3. Add in chicken & potato & 2 scoops of thin coconut milk and stir well. Add in seasoning, stir & cover until chicken & potato are cooked. 4. Add in remaining coconut milk, chilli, big onion & tomato & boil for a while. Switch off the fire & squeeze lime juice. 5. 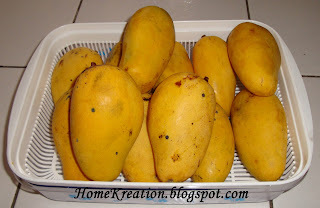 Serve with rice or rotis. Since I have some mangos from my recent visit to hometown, I thought I should try this appealing looking Mango Mochi I saw in "Do What I Like" blog by Florence. The skin is not so sweet and suitable for those who like natural taste of fruit but for sweet tooth like myself I will make it sweeter if the fruit filling is not sweet enough. I love the texture of the mochi skin which is soft and chewy and nice eaten warm or chilled. However, if you're using fresh desicated coconut as coating, I would advice you to cook it for a while in microwave as coconut can easily go bad. 1. Mix glutinous rice flour, rice flour and santan powder into a big mixing bowl. Add in the oil, hot water/sugar mixture, evaporated milk & mango juice. Stir while adding each ingredient gradually untill well blended and smooth. Strain if mixture is lumpy. 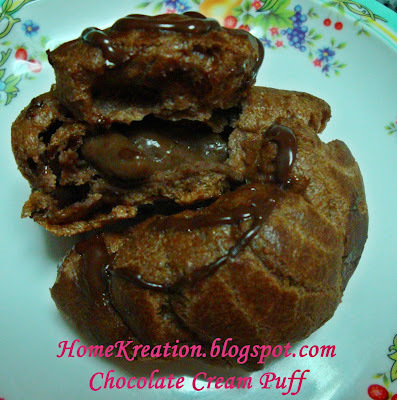 2.Pour batter into a greased container and steam on high heat for 30 minutes. 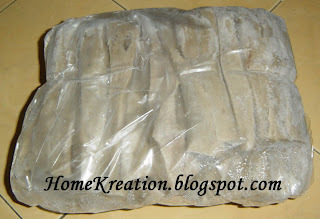 Remove from steamer and stir the cooked dough with a flat plastic knife till it is smooth. Leave aside to cool. 3. Spread some desicated coconut on a small plate. 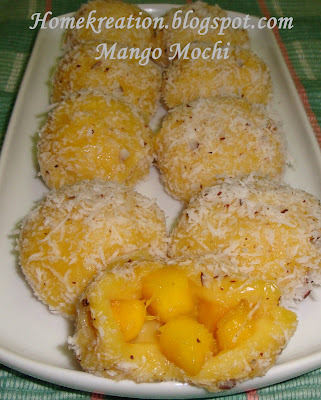 Drop a spoon of dough onto the coconut spread and flatten it into a round disc, wrap in as much mango cubes as desired. Seal the edges tightly and shape it into round balls. Coat the shaped mochi with dessicated coconut. 6. Serve right away or chilled. 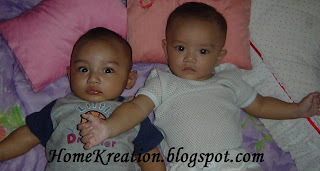 Rizal: "Abah is the reason why my world goes round!" Rusydi: " Yo Abah... You Rock Being My Dad !!!" Radhi: "You're the best in my heart!!!" They all like to say thank-you for a lot of sacrifice you made to give them the best of all! to all dads in the world! 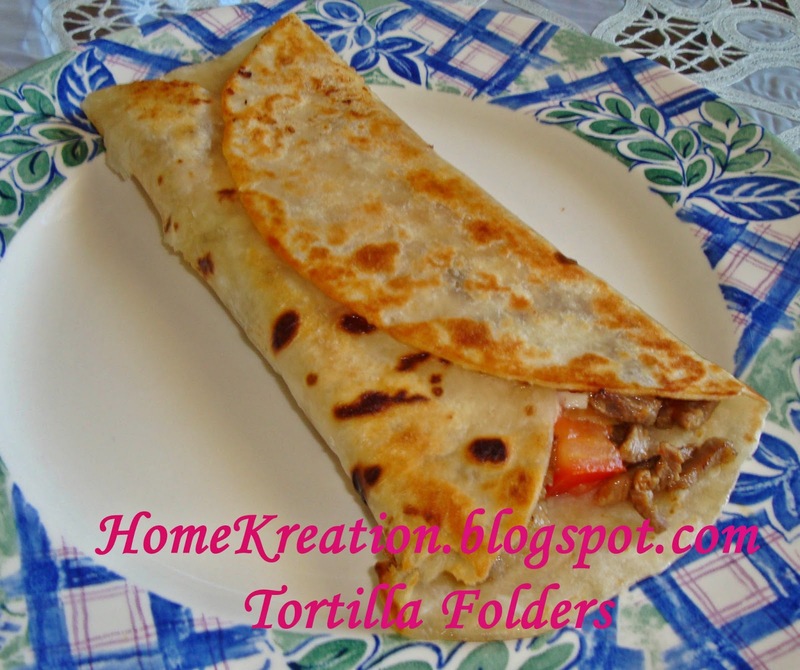 I made Tortilla Folders with beef filling for breakfast this morning. I bought the Tortilla bread during visit to Taiping last week - it has long shelve life until August, so I bought quite a lot. 1. Heat 2 tbsp oil & fry pounded ingredients.Add in chopped onion & beef.Stir until beef is cooked & tender.Add in cabbage & tomato.Season to taste. 2. 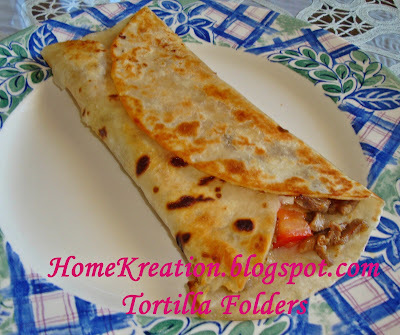 Spread 2 - 3 tbsp of filling onto Tortilla & squeeze some chilli sauce & mayonaise on top. 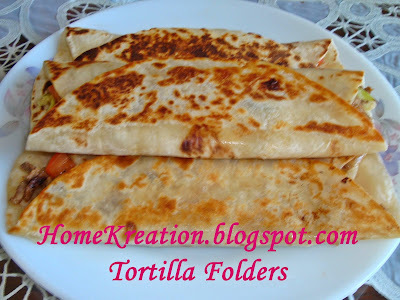 Roll.Heat a griddle & 2 tbsp cooking oil.Fry Tortilla Folders until golden & crisp. I play badminton every Wednesday evening after office hours. So I'll make something simple on the day to ensure dinner will be ready in time. My family love Nasi Lemak & it is easy & quick to prepare. 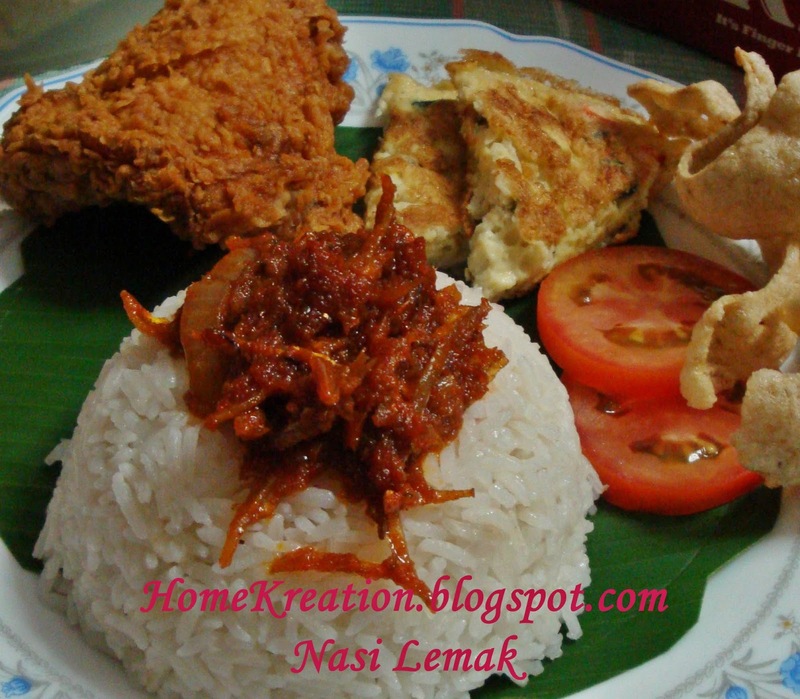 Tonight, our Nasi Lemak is accompanied with Sambal Ikan Bilis, KFC, fluffy omelet, fish crackers and sliced tomato. 1. Place all ingredients into a rice cooker & let it cook. Yang best nya dapat makan masakan Emak. Macam selalu Emak memang sibuk memasak makanan kesukaan anak2 bila kami balik. Along suka makan masakan kampung spt sayur Salang (takde kat Swk ni), Daging masak Lemak Minang, Rendang Merah Ayam, Jering & sambal Kuinin sambal tumis petai. Aisehmen punya syok bantai takde snap gamba lah pulak. Tapi yang tak best nya balik kali ni, we all accident kat highway at Ipoh. Tiba2 je ada lori langgar dari belakang while tengah steady driving. Memang salah dia lah, kata nya brek tak makan. Alamak, ketaq lutut sebab terpaksa berenti tengah2 highway sebab bahu jalan di tutup dengan pengadang. 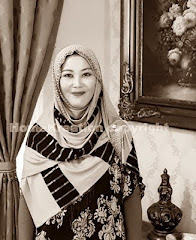 Demi keselamatan anak2 we all beres je kes tu sebab tak nak dok lama2 kat situ. Takut kang kena ram dik lori2 yg laju gila. So pagi ni breakfast kebab lah. 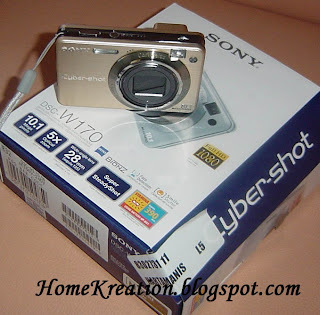 New Toy lah - Sony Cyber-Shot untuk menggantikan Sony camera ku yg dah berumur 7 tahun tu....hehehehe. 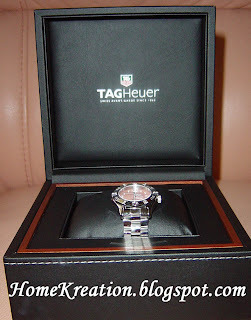 Harap2 nya gamba kat blog ni terang le sikit in the future....hehehe. 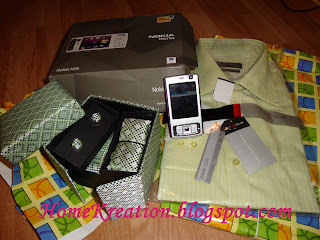 TQ ya Darling hubby sebab belanja....!